Most people know that cinnamon tastes good. But did you know that not only is it a delicioius herb, but it is also a way to naturally control your blood sugar for type 2 diabetes? Well cinnamon has been found to improve blood sugar in people with diabetes. And I’m about to share with you a few benefits of cinnamon for diabetes, and reasons why you may want to include it in your diet. Cinnamon is a polyphenal and it works by improving how insulin works at the insulin receptors on the cell. Scientists at Iowa State University, found that the polyphenol polymers found in cinnamon are able to work at the cellular level to activate insulin receptors on the cell to allow for sugar to be taken in by the cell, and lower blood glucose levels. This generally means that it helps allow sugar to be cleared from your bloodstream and lower your blood sugar levels, which essentially is the reverse of a process that is defective in people with type 2 diabetes. Additionally, cinnamon is also great for speeding up your metabolism. In studies, one half-teaspoon of cinnamon per day was shown to reduce blood sugar levels by up to 20% in type 2 diabetics. This was found in a study by Dr. Richard Anderson, a research chemist from the USDA. 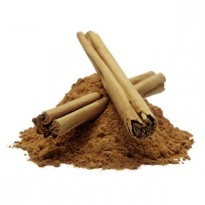 Dr. Anderson found that cinnamon can improve glucose metabolism by 20%. Of 49 herbs, spices, and plant extracts studied, cinnamon was the only food found to have insulin-enhancing abilities. Others also worth noting were peanut butter and tuna fish. In a study in Diabetes Care, cinnamon was found to also reduce triglyceride levels, LDL, and total cholesterol when given at 1-6 grams daily. This is important to not because type 2 diabetics are known to have dyslipidemia. This generally means type 2 diabetics have an abnormally high amount of triglycerides and LDL (the both bad cholesterol) and a low amount of HDL (good cholesterol). To make this work all you need to do is sprinkle ground cinnamon on toast, or stir it into juice or coffee. You can also add cinnamon to your teas or your oatmeal in the morning. The recommended amount of cinnamon is no more than a teaspoon or less a day. This may be worth trying out and if it helps to lower your blood sugar you may want to add this to your diet. The main take home here is that everyone is different and while some people may see good results others may not. Now while there have been numerous favorable results, studies, and data on cinnamon use in controlling blood sugar, the verdict still appears to be out. There are studies out that say that cinnamon is over-hyped and not effective at lowering blood sugar. Not to mention, of all of the doctors that I have spoken to about cinnamon over the years, I have gotten mixed reviews. Some say it has worked for their patients, some haven’t used it at all; while some say it has been shown to be beneficial. The nice thing about cinnamon is that it is cheap and you can test it right at home. There’s no need to buy any extract of it or other expensive form of supplement. The original research done by Dr. Anderson was with the cinnamon found right at grocery stores. So as with anything test for yourself.